After an unusually active fourth quarter, non-residential contracting in metropolitan Pittsburgh took a breather in the first quarter. Contracting volume fell 13 percent compared to the same period in 2011, according to market research firm Tall Timber Group. Contracting during January to March was $440.7 million, down from $507.6 million in 2011. Following a fourth quarter in 2011 that saw $700 million in contracting, the demand for commercial and industrial space is still improving while vacancy rates continue to fall. It’s worth noting that the number of projects getting started was slightly higher than in first quarter 2011 and the trend of private spending driving the market continues. There is strength in several segments that are keys to improving markets. Office/industrial construction continues to flourish and these are indicators of stronger employment markets. Retail is also solid if unspectacular. The number of retail projects was up 22% compared to 2011 and the rumors of big box activity have begun to swirl around the more desirable locations. The unknown variable last year was financing and since the fall it appears that the pendulum has swung back towards deploying capital instead of conserving it. Conditions are still conservative but more like historical norms. We see the current volume and the accelerated schedules of some of the big projects – The Tower at 4 PNC, UPMC’s Center for Innovative Science – as confirmation of the regional business health and relative availability of financing. Permits for single family detached homes spiked steeply during January of 2011 in metropolitanPittsburghbecause of a carryover from the short-lived sprinkler mandate and the artificial increase is one of the reasons for a decline in single-family permits in 2012. The overall housing numbers are indicating that the housing market is getting a firmer footing in the first quarter of 2012, with an increase in total permits of 19.5 percent. During the January through March period 408 permits were issued for single-family detached units, down 17.6 percent from the same period last year. Permits for attached units and apartments more than doubled however, with 396 units started compared to 178 during the first quarter of 2010. The overall housing construction volume was 804 units. While that represents growth from 2011 it’s instructive to remember that the activity is still roughly half of that during 2004. The first quarter’s housing starts mirror the growth patterns in the regional economy. For several years the most active housing sub-markets were primarily in the north and south along the I-79 corridor but some of the more active markets were also in high growth areas in bedroom communities like North Huntingdon and Hempfield in the east or Hampton and Richland in the north. A quick look at the municipalities with the highest number of starts in quarter one reveals that all are located along the I-79/I-376 corridors where natural gas and energy are booming. One sub-market with low activity that has been the most active for the past four years – the city of Pittsburgh – has seen brisk activity in the construction of residential units in the first quarter but almost all of it has been in adaptive re-use projects. 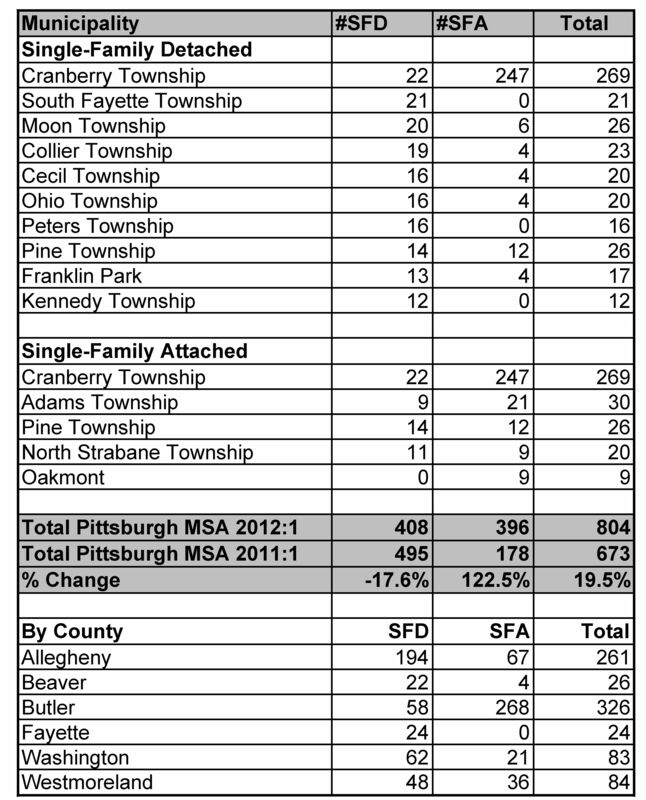 Housing activity in the six-county metro Pittsburgh area in 2012. This entry was posted in Regional construction, Regional Economy, Uncategorized. Bookmark the permalink.